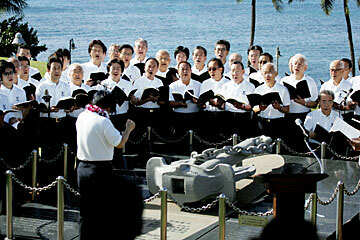 A hundred members of the Roppongi Male Chorus Club paid tribute at Kakaako Waterfront Park yesterday to the nine people who drowned after their fishing training ship Ehime Maru sank in February 2001 after being hit by the U.S. nuclear submarine USS Greeneville. The 45-minute ceremony ended with a laying of wreaths at the memorial site. 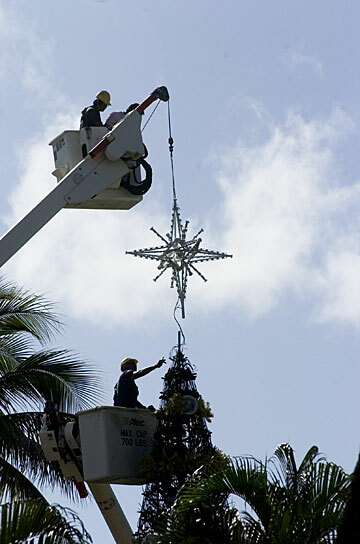 Honolulu City and County workers removed the star from the top of the Christmas tree in front of Honolulu Hale yesterday.